You are here: Home > Dental > Suffering from Bad Breath? Are you embarrassed of your bad breath? There are a variety of different reasons that you could be suffering from bad breath such as the foods you eat, your oral hygiene, or even certain health issues. Certain foods you eat such as onions, garlic, cheese, alcohol, and more get absorbed into your blood stream and move to your lungs. This leads to the foul stench you might notice in your breath and can be very difficult to get rid of. Poor oral hygiene, such as not brushing your teeth enough or thoroughly enough, results in rotting food and bacteria growth which also causes the foul smell. Other health issues such as dry mouth, sinus infections, and gastrointestinal problems can also cause bad breath. Saliva is necessary in order to keep the mouth clean and to get rid of bacteria, without enough saliva the amount of bacteria in your mouth will continue to increase. How should you go about treating your bad breath? Improving your oral hygiene would be your first step towards a fresher breath. Make sure to brush twice a day with toothpaste that contains fluoride and to floss regularly to get rid of food debris. 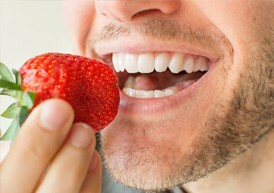 Keeping track of what you eat can help you find out if the problem is what you are eating and adding more fruits, vegetables, and water will improve your oral health. Also, try to stop smoking or chewing tobacco products because it can severely affect your oral health. Even before you try some of these steps to get rid of bad breath it is best to visit us here at Cadena Family Dentistry. We can provide you with the dental care you need at a fair price. We also provide a variety of other treatments such as extractions, veneers, crowns, and we can even whiten your teeth with ZOOM whitening.